Sen. Mark Udall of Colorado wants the Air Force to transfer excess cargo planes to the Forest Service so they can be converted to aerial tankers to fight forest fires. Forest fires are becoming more common, but the Forest Service only had eight aerial tankers during the 2012 forest fire season, prompting the Air Force to help. Four airmen with the North Carolina Air National Guard were killed in July when their C-130 crashed as they were fighting a forest fire in South Dakota. While the Forest Service needs planes, the Air Force is trying to cut cargo aircraft as part of budget reductions. The 2013 National Defense Authorization Act allows the Air Force to decide whether to get rid of C-130s or C-27s. 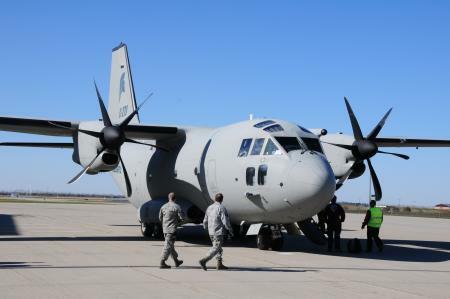 Air Force officials have said the service plans to divest its inventory of C-27J aircraft. The Forest Service believes these planes would be well suited for dropping fire retardant on blazes and transporting personnel and equipment, a congressional staffer said.